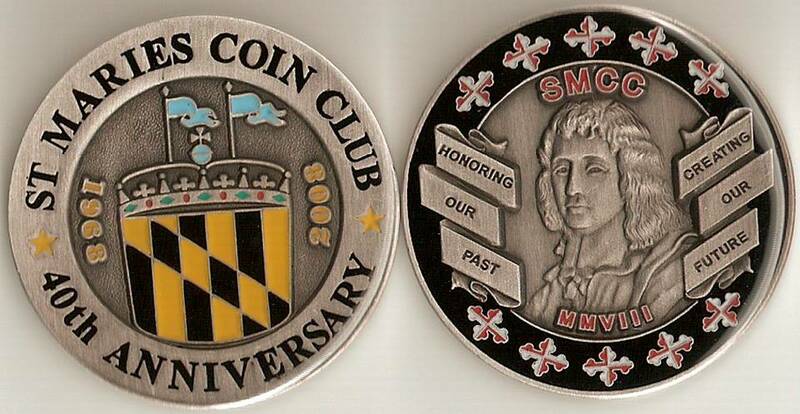 Celebrating our 40th anniversary, St Maries Coin Club of Maryland is offering this collectable medal. The 1.5" metal is made from solid brass with antique silver, colorized and epoxy on both sides. It features Cecil Calvert and a symbolic Lord Baltimore coinage. The medals can be purchased for cost; ($10 each postage paid) at the clubs e-mail address (stmariescoinclub@comcast.net) or Brian J. Allen PO BOX 365 Lusby Maryland 20657.